The essay by Khushdeep Kaur Malhotra brings to fore the narratives of Kashmiri Sikh women following a gruesome massacre of Sikhs in Chittisinghpora in 2000. The essay attempts to integrate the experience of the militarization of Kashmiri Sikh women with the dominant narrative of Kashmiri Muslim women and argues for creating space for Sikh Women in Kashmiri discourses. The article is third in the series from Wande special issue on Kashmiri women titled Me and Militarization. Authors Note: Excerpts are drawn from interviews the author completed for her dissertation fieldwork between April-October 2018. With the exception of Mr Nanak Singh, the names of all respondents have been anonymized to protect their privacy. The author would like to thank Ifra Nissar and Gousia Binti Ghulam for conducting, transcribing and translating interviews in Kashmiri. Interviews have been minimally edited for clarity by the author; edits have been placed in parenthesis within the original language. Translations have been provided in English. “Gulab deyan phullan nu maar ke sutt gaye” (they plucked our roses, pillaged them and left), recalls Kaur1 when I ask her what she remembers of the fateful evening her husband of ten years was gunned down along with 35 other Sikh men in Kashmir’s largest targeted attack on the Sikh minority—the Chitti Singhpora massacre of March 20th, 2000. A well-built, beautiful woman with green eyes, her face softens as she lovingly remembers her son, also massacred that evening. “Eko munda si (mera)..matric paas (si)...first aaya si matric wich” (I had only one son, who stood first in matriculation), Kaur1 tells me as she begins counting her dead. Almost 19 years later, the pain of losing seven family members is still crisp in her eyes, as she stares at me directly, looking for answers that I don’t have. A few hundred meters away in a different mahalla (neighbourhood), Kaur2 lives in a house with a courtyard which should have been filled with happy memories of Kashmir’s beloved nun chai and tchot rituals, but instead is pregnant with a haunted silence. As we sit sipping tea on her living room floor, Kaur2’s soft voice quivers as she says, “Jis vele goliyan di awaaz aayi ta mere jeth, o gaye dekhan vaaste, ta kehn lagge, ‘oss nu goli ayidi hai, odi lattan nu goli ayi di hai, ta ona nu haspatal lai gayede.’. Aina nu pata si ki o mar gede, odi death ho gai di hai” (upon hearing gunshots, my brother-in-law rushed to the scene. They told me that he had been shot, his legs had been shot, and he’d been taken to the hospital. They knew he was dead, that he had died). As her family mustered the courage to tell her what happened to her husband, she recounts, “matlab main rona shuru kar ditta, ‘o aye ni ghar, kiddar gaye?’. (Jeeja) akhan, ‘ona nu goli aayi di hai, ona nu Anantnag lai gayede ne, te swere tak aa jan ge’” (I started to cry, ‘he isn’t home yet, where is he?’ My brother-in-law repeated my husband was shot, in the hospital and would be home by morning). In the wee hours of dawn, they finally informed her of his death, “phir shaami…matlab swere de 4 vajje kain lagge mainu, ki aao te dekho. Othe ki dekhiye, laashan de dher lagge. Goliyan maar ke te sutt gaye" (then in the evening, I mean at around 4 am in the morning, they asked me to come see for myself what happened. Little did I know what I was going to witness. There was just a pile of bodies laden with gunshots and left for dead). In their 72 years of struggle for azaadi (independence), Kashmiris have witnessed countless heart-wrenching stories. Where both the warring states of India and Pakistan have routinely glossed over the impacts of this unending conflict on Kashmiri lives, scholarship on Kashmir has done an excellent job of refocusing attention from statist narratives to people’s experiences living with violence: documenting historical events, critiquing the burgeoning armed occupation of Kashmir’s landscape, recording deaths and disappearances and everyday injustices, and retrieving oral histories of times past and present. Kashmir’s incredible women, who have for seven decades borne unimaginable losses, of partners, children and homes, of dignity and rights, have too been brought to the forefront of this scholarship, filling an important lacuna that existed in our understanding of their experiences vis-à-vis this conflict. Although wars may be “fought by men, with and against other men, towards the achievement of male-defined purposes and ends” (Sangra 2018, 1), it is often women to whom the spoils are left. As equal stakeholders of the movement, Kashmiri women have confronted the dually oppressive forces of masculinity and militarism, forcing us to rethink “narratives and impacts of occupation” (Kaul and Zia 2018, 1) while holding together “the last vestiges of community” (2018, 1) as they watch their men die. While the focus on Kashmiri women’s experiences in this scholarship has enabled them to reclaim their rightful position in history, its scope remains limited to Kashmiri Muslim (and to some extent Hindu) women. Stories of Kashmiri Sikh women, who have also shared the burden of conflict alongside their Muslim and Hindu counterparts, are noticeably absent from these discourses. In this article, I attempt to begin addressing this gap by retrieving the unheard stories of Chitti -Singhpora’s Sikh women tucked away for long in the vestiges of Kashmir’s geographic and historical memory. I recover these stories not only to prevent the erasure of Sikh women’s struggles but to explain how they become a source for building inter-communal solidarities. Doing so also opens the possibility of reexamining notions of what constitutes “threats to the minority” and the “minority exodus” we so commonly hear about in Kashmiri discourses. 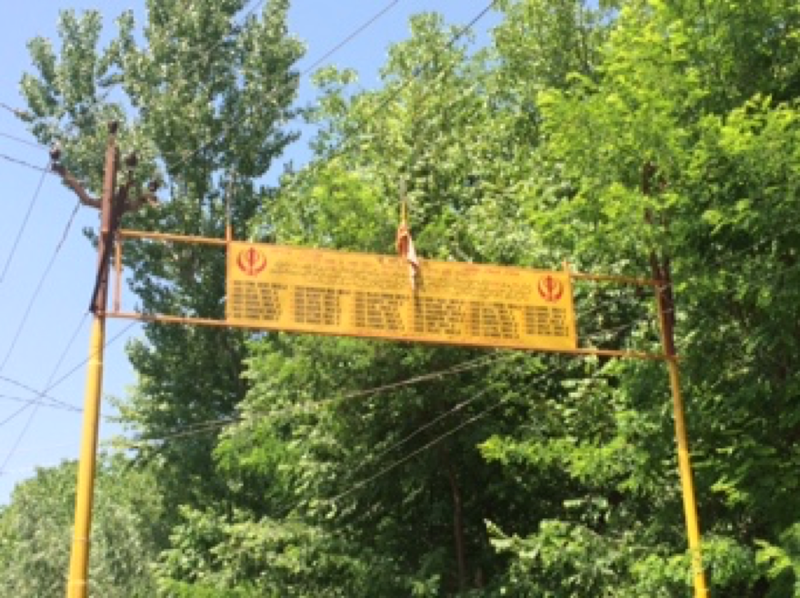 The largest of 14 Sikh villages in South Kashmir, which has lately become the locus of mujahideen fighters, Chitti Singhpora is situated about 6 kilometres uphill of Anantnag (or Islamabad) city. Reaching the village by public transport is no simple feat. Once on the road which marks its entrance, one has to walk about a kilometre to enter a recently erected “Khalsa chowk” memorial, which bears testimony to what happened here 20 years ago. Dotted on all sides by lush apple orchards and verdant forests, Chitti Singhpora’s breathtaking scenery belies its turbulent history. Known in Sikh popular discourse as “shaheedan da pind” (the village of the martyred), it houses about 30-40 Muslim and close to 400 Sikh households. While the Muslim neighbourhoods are at its peripheries, the core of the village is Sikh. What happened here on March 20th, 2000, left no one untouched. A few hours after US President Bill Clinton touched down in Delhi on March 20th, 2000, masked gunmen wearing army overalls made their way into the village at around 7:30 pm. The sole survivor and eye witness of the massacre, Nanak Singh, now in his 70s, remembers the men in army overalls summoning the village’s Sikh males for what they said was a routine identity check. Asked to line up in front of the two gurudwaras (Sikh temples), gurudwara Samundri Hall and gurudwara Shaheed Niwas, located only a few meters apart, the unsuspecting residents, used to crackdowns, did as they were told. Eighteen men stood in front of each gurudwara, believing they were in “chardi kala” (While the literal meaning of the words “Chardi kala” is “rising state”, the phrase is meant to convey the Sikh belief in divine justice, hence this attitude of being positive and optimistic, or in “chardi kala”), confident that no harm would come to them. Moments later, they were gunned down in their Waheguru’s (God’s) abodes. 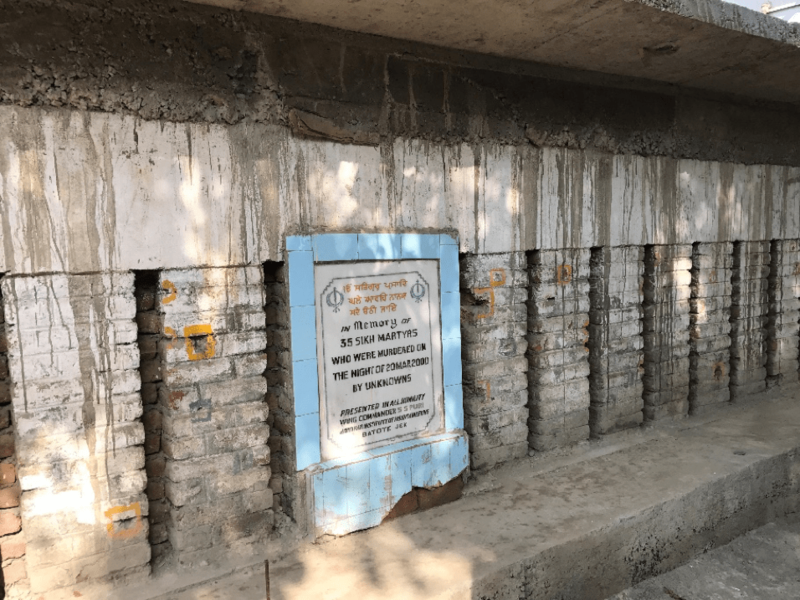 Kaur3, whose home is steps away from gurudwara Shaheed Niwas, remembers, “Mera kar vala kehen lagga ‘una nu katha kiti da hai, apni army aayidi hai’. Kundi laake aaye si baron. Main nikli saan baar dekhan kaun aayda si. Mein dekhya faujian di uniform vich aayde saan. Mainu kende ‘Bibi, aap andar chale jao, aapka kaam nahin hai, humein inke identity card check karne hai, uske baad crackdown lagana hai, phir chod denge’. Maine unko bola mere husband ko bhejo. Mere husband bolne lage ‘nahin nahin aap andar jao, apni army aayi hai, koi baat nahin hai, aap andar chale jao, abhi aata hun main’” (my husband told me our army has come, they have gathered the men. He had locked the door from outside (before being summoned). I went outside to see, I saw men in army overalls. They told me to go back inside, that I have no business outside. They said they will examine the men’s identity cards, conduct a crackdown and leave. I told them to send my husband. Then my husband replied, ‘go back inside, it’s our army, we have nothing to worry, I will be back momentarily’). Those were the last words Kaur3 would ever hear her husband speak before he succumbed to the gunfire. As the 19th anniversary of the massacre approaches, justice seems like an illusion to the families of the massacred. Singh1, who lost his father in the massacre, tells me, “E ta itihaas banke rehe jayega, hor kuch ni hona” (this will become yet another chapter in history, nothing will happen). For this family, forgetting is complicated by a window forever open into the past: their home directly overlooks gurudwara Samundri Hall. Dissuaded by the community against migrating, they continue living without answers. Who were those men in the army overalls, whose celebratory chants of “jai mata di” (victory to the mother) before they disappeared, have become something of a legend? Why did they kill 35 innocent men? “Asi ki kahiye” (what can we say? ), says Kaur2, “asi kuch ni kehe sakde” (we cannot say anything), replies Kaur3. While no one wants to speculate for fear of safety, the pervasive narrative across Kashmir, among both the Muslims and Sikhs, is that the Indian state was behind the violence. The intent behind Chitti Singhpora, it is widely believed, was to further communalize the Kashmir issue, this time by driving out the Sikh minority. The mass exodus of Kashmiri Pandits in 1990 after following serious threats has been used to thoroughly communalize the Kashmir ‘issue’. “Bill Clinton ko aana tha yahan pe, to uski vajah se inhone mahol change kiya yahan pe..ki mahol yahan pe theek nahin hai” (Bill Clinton was visiting, they had to create tension, to convey that the situation is not alright here), Wagay1, a young Muslim entrepreneur said. In the days after, Kaur5 tells me, “keda keher peya kuch nahin pata” (the turbulence that came I cannot know), as she describes the chaos that followed. Kaur1, whose husband was himself a retired fauji (officer), says, “Halat saddi ki si? Jis tarah o mar gai si, asi vi mare de saan. Tin saal tak sanu sojh ni si ki bahar horeya hai, ki ni horeya hai” (What was our condition? We were dead too, just like they were. For three years, we didn’t know what was or wasn’t happening outside). Kaur3, staring into the distance remarks, “Hum to aasman se gir gaye…yeh kya ho gaya” (it was as if we fell from the skies, what had just happened?). As news of the massacre spread, so did anger among the Sikh community, both in and outside Kashmir. So much so that Muslims, afraid of retribution, fled the village temporarily. Khan1, a woman from one of the earliest Muslim families to settle here, recalls, “Beh ae'ses kunizani gharie, police aav task force aav yeti aaes ni neber neras jai pati yeli policesas ti basiov yeti chu Khatri. Aesi sikan nish. Pati kaed aa'es police'an yeti” (I was alone at home. The whole place was crowded with people, police, task force. And then, when even the police realized it was harmful to us to stay here among the Sikh people, they helped rescue us). Khan1’s family didn’t return for a month, “Meh dich pati kuenz policesas hi. Panie gayas seer. Shuer travim school taeth. Pati aayi aakh raeth pati gari wapas” (I gave the (house) keys to the police and left for Seer. I got my children admitted in school in that village and stayed there at least a month). As the Muslims left, eminent politicians, including Shabeer Shah, Farooq Abdullah, Prakash Singh Badal poured in, monetary compensations were announced, and the family members of the deceased were given jobs under the SRO-43 act of the Jammu & Kashmir (J&K) government. Both J&K Police and the Army stepped up recruitment of young Sikh and Muslim boys from the village, as security cordons including Rashtriya Rifles (RR) and CRPF (Central Reserve Police Force) posts, propped up, surrounding gurudwara A, and the outer boundaries of the village on each side. These posts are still standing, the men behind them closely observing the goings-on in Chitti Singhpora. Nineteen years later, life goes on for these women, now under the constant militarized gaze of the men in green overalls commissioned to guard them. The irony is not lost on them. But what has it meant for these women to keep living in a place where the “home-outside binary” has been blurred by not knowing, where conflict has pervaded pervade beyond combat grounds and into the safe spaces of their homes (Mushtaq 2018, 1)? For Kaur1, forgetting has been difficult, “Bas yaad aundi si ona di hor ki? Ona diyan yadan vich guzar de si din raat, koi khaan peen da chain ni si. Ona diyan yaadan vich dhunde saan ona nu” (I spent my days and nights thinking about them. I had no desire to eat. I just searched for them in their memories). But for Kaur2’s son, it was reminiscing that was tough, “Mainu apne father di shakal vi yaad nahin” (I don’t even recall what my father looks like anymore). For Kaur6, “akele akele, bande bagair, tabbar bagair, ghar wale bagair, ghar ni chalda theek, kam kaaj ni chalda” (alone, without a husband, a family, the home can’t go on, work doesn’t go on). Providing for both her sons while working her job, Kaur2 moved her family to a single room in Mattan, so her children could finish school. Not able to afford higher education for both, Kaur2’s elder son dropped out and began eking a living as a driver. She married him off at eighteen, “ghar nu sambhalan vaaste” ([so the daughter-in-law] could help look after the house). “Mere vadde pra di padhayi chutt gayi, o padhayi ton duur ho gaya.. ghar nu sambhalan laggeya” (my brother had to give up his education, it became the furthest thing from his mind as he had to look after his house), reflects her younger son. Kaur3, too married her daughter off early (“oda vya kar chadeya”), she couldn’t afford the burden. Beyond making home the frontier “where people's lives and spaces are subjected to militarised control” (Mushtaq, p.), as for their Muslim sisters elsewhere in Kashmir, it is clear from these accounts that militarization has doubly marked these women—as wives of the martyred but also as widows—and resulted in particularly problematic gendered constructions of identity. While their roles after the massacre saw an “un-gendering” so to speak (“Pyo di jagah vi ditti bachyan nu, pyoh da pyar vi ditta, ma da pyar vi ditta” [we had to fulfil the father’s role as well, give the kids both a father and a mother’s love]), their experiences as women became more deeply entrenched in the gendered politics of widowhood. As these Sikh women battle the stigmata of widowhood, so their Muslim counterparts fight the familiar cycle of fear. “Aaes khu'ech army kyazi ki tim chini sahal sahal yali travaan yitis kalas ni timan panun maqsad puri'e chu gasaan (we were afraid of the Army as you know they don’t free you unless they do their work), Khan2, a Muslim female remembers of the time. “Sikh aaes tayar se'an makaan zaalni khatri tamie vizi”, (the Sikhs were ready to burn our houses then), Khan3, her female neighbor, adds. That was then, but “aaj ka mahol jo hai, who sabse behtereen hai” (things are better than ever now), Wagay1 tells me. As the dust settled and Chitti Singhpora’s Muslim families returned after their panicked exodus, Khan1 remembers her long-time Sikh neighbors being angry with her, “Lekin yim sikh aa'es ni karaan aa'si seet kaath kiheen” (when we came back, the Sikhs didn’t talk to us at all). But this anger dissolved with time, as the ‘facts’ behind the massacre became murkier. The encounter that followed in Panchalthan village five days later, in which “bechare gujjaran nu maar chadeya” (they killed those innocent gujjars), the senseless killings of protestors demanding justice for these gujjars in Brakpora, another nearby village, and the botched inquiries that followed and were never made public, were enough to convince the Sikhs this was not the mujahideen’s doing. “Lekin temi vizi khol yimav militant'an sorui. Aa'si chu yetheth aakh laedki yimav dop yiti oues. Pati korukh sue tre'in wariyan band lekin sue oues beh gunnah. Lekin pati gov yiman sharam pani jai ki aaesi kyazi dop apuz huend naav” (at that time they said the militants killed them. There was even an innocent guy who was accused and jailed for 3 years. But later they regretted accusing him and the militants for all this), Khan1 tells me. In a region rife with communal fault lines, both communities have worked hard to move past this horrific event, repairing the ruptures it left in its wake and building solidarities. When I ask Kaur2 if she’s afraid of a repeat of 2000, she smiles, “(E) kende ne asi kyun mariye apne Sikh bhravan nu? Aaj kitni militancy chal rahi hai, kade ni sadde naal kuch kitta. Kade police waliyan nu maarde ne ta Sikh hai ya Muslim hai nahin dekhde” (they ask why we should kill our Sikh brothers. Even in this heightened militancy, they haven’t let any harm come upon us. When they (the mujahideen) kill the police, they don’t see whether he is Muslim or Sikh). For the Muslims and Sikhs of Chitti Singhpora, solidarity is based not on “an enforced commonality of oppression” (Mohanty 2003, 7) but on the recognition of diversity and difference as central values “to be acknowledged and respected, not erased in the building of alliances” (2003, 7). To an outsider, it might be strange that they won’t eat at each other’s homes, “chai pi lete hain, lekin khana nahin khaate.. ek doosre ki shadi mein bhi jaate hain, par (khaane ke bajaye) zinda murga de dete hain!” (we have tea in each other’s homes, but not food. We even attend each other’s weddings, but instead of serving them food, we sometimes give them a live chicken [so they can cook it how they like]), because of religious rules governing the consumption of meat, but to them these are simply ways of life to be respected. Khushdeep Kaur Malhotra is a PhD candidate in Geography and Urban Studies at Temple University.